So here is my story. It is a short story, a nice story, and completely true! With hope that it will draw others who have strayed closer to the true path, or at least give them something to think about. First, I should provide some information about who I am and where I come from. I was born into a "mehadrin" secular family, former kibbutz members, with no connection whatsoever to Judaism, or any other religion. As a child, my family left Israel, and moved to Europe, where we cut ourselves off completely from our Jewish identities. We lived as non-Jews in every respect, following their calendar, with no regard for any of the Jewish holidays. Rosh Hashanah and Yom Kippur played no part in our lives. Nothing. Nothing at all, except for Chanukah, when we customarily phoned family members in Israel to wish them a happy holiday. On the first night we lit a candle, and sang the traditional song, "Maoz tzur". That was the sum total of our Judaism. Of course, whenever anything about Israel was mentioned on the news, we turned up the volume and listened with full attention. But that was more an expression of our national, Zionist loyalties. We loved our country, and missed our people, just as a man from Uganda or Bangladesh living in another country, misses his native land. But I, an eleven-year-old boy at the time, wouldn't acclimate. I refused to immerse myself in the foreign culture, and abandon my Israeli, Jewish identity. I gradually changed from the friendly, social, active child that I had been in Israel, to a social outcast. My peers taunted and shunned me, and I was extremely lonely. That pitiful reality served as fertile ground for my quest for truth and the meaning of life. I wanted to understand what was happening to me. At age thirteen, I began to devour books about spirituality, mystical energy, life after death, etc., with hopes of discovering answers. But nothing I read satisfied me. I didn't find any spiritual avenue that sounded attractive, or held promise of any real spiritual satisfaction. I wanted something that would change my life, and set me apart from the mass of human beings who are caught up in the race for work, money, possessions, status…in the act of constant material self-improvement. People who went through life like machines, without knowing what made them work, or what they were doing, or what their ultimate goal was. They were focused on moving forward, making progress - but to what end? I was told, "That's just the way life is. Life is full of pressures and deadlines, and we all have to keep up if we don't want to fall by the wayside. Now is not the time to start asking questions…"
Like a mouse in a cage, running on a wheel, that turns around and around and never stops. No!!! I wanted a justification for all the efforts we made in life, which ultimately ended with death. If there was no justification for it all, then why take such a long, hard journey. It could be cut short…I was troubled by such thoughts, and I continued to read, but I never found answers to my questions. (Judaism never interested me, because I was searching for a universal solution. I mistakenly perceived a religion that was defined by a specific language, country and people to be inferior.) I was also looking for a way to cut myself off from the material world, for an ascetic way of life. One day, in the city library, I found a book about Buddhism. The idea of release from the chain of suffering in life, the idea of a personal spiritual journey sounded enchanting. In a very short period of time, I read every book on Buddhism on the library shelves. Secretly, I began to practice what I read about, especially meditation and breathing exercises. By the age of sixteen, I finally reached the conclusion that I would completely abandon the modern, Western way of life that I hated so much. One day, I would become a real Buddhist monk. That was my answer! That was the beginning of a long battle with my family, as my parents were shocked to hear what I was planning. They had expected their youngest son to follow in the footsteps of his older brothers: to get a university education. Now, I seemed to be going crazy right before their eyes. I was adamant, and strong in my convictions. I would not be swayed. I started working at odd jobs to save money for traveling, and then began visiting monasteries throughout Europe. Later, I went on trips to northern Asia. There was also a period when I still hadn't found exactly what I was looking for, that I spent months in my sister's home, wasting time. She had offered to let me stay with her when I could no longer live with my parents. After months of inactivity, I was desperate to continue my search. At age twenty-three, I traveled to Sri Lanka, in southeastern Asia. I hoped that there, I would find a monastery I could feel comfortable in. After traveling the length and breadth of the country in search of the biggest masters, I met an old monk who questioned me intensively about the purpose of my quest. As he looked deeply into my eyes, I realized that the man opposite me had a finely tuned spiritual sense, and that even though we had just met, he knew me intimately. He sent me to one of the greatest meditation instructors, where I was to complete a course of training. I would be evaluated by the instructor, and then return to the old man. I was very enthusiastic about the course, and was prepared to invest all my energy in learning the techniques of silent meditation. There were other participants from Western countries who found it difficult to sit still for so many hours, barely eating or sleeping. The idea was simply to sit silently and confront yourself. Every minute felt like an hour. It was as though time had stopped. I hadn't arrived there as a tourist, eager for a new experience to tell my family about when I got back home. I had a different reason for being there altogether. I took the whole venture very seriously! I practiced all that I had already learned over the years, along with the new material I was exposed to during the intensive course. Right from the beginning of the course, I was able to enter a deep meditative state. I did breathing exercises, and my breaths grew deeper and lighter. I managed to disconnect myself from my physical body and its sensations, and to keep my mind free of all thoughts. I concentrated on my breathing, until I breathed in a totally passive manner. One day, during the course, I opened my eyes in the middle of a meditation session. I slowly looked to the left, and then to the right, and saw that all of the other monks and participants in the course were in deep meditative states. Our teacher sat in front of us all, on a raised stage. His eyes were also closed, and he, too, was meditating. I shut my eyes again, and immersed myself once again in the task of focusing all of my energy and concentration on my breathing. Suddenly I felt something - it was like a light shining on me from above. I opened my eyes again, and looked up. I had a vision, which I initially thought was a result of the deep meditative state I had achieved. What I am about to describe may sound unbelievable, so I must emphasise that I was totally conscious and mentally sound during the experience. My mind was clearer than it had ever been before - I was not under the influence of drugs. I refuse to consider any psychological, scientific, or other explanation for what I saw. What I do believe is that there are many scholarly, rational, sane people among us prefer to deny certain facts of reality, than to accept them and be obligated to make changes in their lives. They aren't interested in having their theories refuted, and do not want to give up any honor and fame that they may have achieved. Very few of them are prepared to consider the possibility that they are mistaken. Those people will always define any spiritual, miraculous, or supernatural occurrence as illusions, lies, or inaccurate perceptions. They will categorize the individuals who have such experiences as being out of touch with reality, weak in nature, hysterical, etc. In any case, whether you believe what I am about to relate or not doesn't matter. The story has to be told, and if it causes anyone to change the way they view Judaism, it has served its purpose. The distant light came closer to me, and then an image appeared. It moved closer to me, until it was hovering right over my head. I recognized the image as my grandmother, blessed be her memory, who had died a number of years ago. At the time of her death, my grandmother had been over ninety years old, bent over and wizened. Now I saw her as a young woman, standing straight and tall, with a smooth, shining face. Her dress and head covering were pure white, like a neon light. In spite of her youth and beauty, I still knew that the woman as my grandmother. It is important to mention at this point in the story, that I was not shocked, or shaken, or excited by what I saw. I was completely calm and under control, as a result of the meditation. Just as a medical student is not fazed the first time he sees a beating heart, because his training has prepared him for such a sight, I was not surprised by the vision I had of my grandmother. After years of studying the tenants and practices of the Buddhist religion, and perfecting my meditation skills, I naturally anticipated that one day I would have a heightened spiritual experience. Just as the medical student must not faint, or vomit, or grow anxious when he sees a beating human heart - if he really wants to be surgeon one day…I had no reason to get upset about what I saw. I saw my grandmother looking at me in with an expression of intense sorrow and pity. She stretched her hand toward me, and motioned back and forth with her finger, indicating that I should leave. I reached my hand out, as though to take hold of hers, and engaged in silent communication with her. Our hearts connected. "Abuela," ["Grandmother" in Spanish] "I will come with you. Just tell me where we are going." She didn't answer me, and I was not able to touch her. She suddenly rose up, moving away from me, and then completely disappeared. At that point, I might have felt shocked, or excited, or frightened…but I was a practicing Buddhist, and I took the experience and turned it into an exercise. Anyone familiar with Buddhism knows that thoughts are to be released, otherwise they become distractions. In my naivety, I thought I was making progress by making light of the vision. I put it out of my mind, and continued meditating, as though nothing out of the ordinary had occurred. A little while later, with no previous warning, I felt that something strange was happening again. Again, I opened my eyes, and looked to my right and left. As before, I saw that everyone else in the hall was meditating, with closed eyes. As before, I had a vision. I saw a group of monks, clad in orange robes, walking in a long line towards a shiny, white, marble staircase. The stairs went up to the Heavens. As the monks marched in single file towards the staircase, they gradually aged, growing wrinkled, stooped, and skeletal. By the time each one of the monks reached the staircase, he only managed to place a foot on the first step. Then, each one died. They all fell to the ground, and their bodies rapidly decomposed until they were nothing but dust. A strong wind blew the piles of dust and rags away, and thus the monks disappeared, one after another. The vision left a clear message in my heart: This is not the true way to light, holiness, or truth. This is spiritual death, spiritual suicide! And then, the vision disappeared, and I again dismissed its memory from my mind. Later that night, while meditating, I had a third vision. But this time, my vision did not merge with reality. This time, I sensed that my body was no longer in the hall, among the other participants, when the vision appeared before my eyes. In this vision, I was sitting alone, in a meditation position. My body rose above the ground, and like a car gradually gathering speed, I began to move down a wide, straight road. On either side of me was a wildly cheering crowd, though I heard nothing. Everything proceeded in slow motion, and I looked to my left and my right, trying to discern who the people in the crowd were. I noticed that they all had kipos on their heads, side curls, and long beards. Their faces radiated joyous light, and they were all smiling. Their eyes twinkled, and I thought to myself, "They have so much light in their eyes!". Then I focused my eyes on one of the people in the crowd. He had long blond peyos [side curls]. He seemed to be watching someone or something that was moving before me, who I was following. I tried to see who was on the road in front of me - at this point, my memory is fuzzy. All I remember is that I couldn't clearly identify the person, but I knew it was a very important figure. When I tried to get a good look at him, I was blinded, in the manner one is blinded when looking at the sun. Somehow, I understood that the man represented the final redemption, the Geulah, the Mashiach in Jerusalem. Then the vision was gone, and I found myself back in the meditation hall. I couldn't get that third vision out of my thoughts. I recalled all three visions, and tried to figure out what they signified - especially the last vision. Suddenly, I felt my teacher tap me on the shoulder. I looked up, and he silently signaled to me to follow him outside. I unfolded my legs, and waited for some sensation to return to them, as they had fallen asleep. I went out to the teacher, and he asked me what I had seen. He obviously knew that something had happened to me during the session. For the first time in days, I began to speak. I described the first vision to him - when I had seen my grandmother - and the moment I finished my story, he showered me with words of explanation and interpretation. Everything I had seen and heard had been a hallucination, originating in my own mind. If I didn't ignore them, they would trap me. He also praised me for making so much progress so quickly, and encouraged me to be strong and overcome the thoughts my visions had kindled. I listened to him. I dismissed the visions as though they had never occurred, telling myself that if I didn't gain control over the tricks of my mind, I could never make any more progress. I refused to let the messages of my visions, which contradicted everything I was learning about Buddhism, to confuse me or weaken my resolve. But the truth is extremely powerful! When the long night of meditation ended, we were all dismissed for a few hours of sleep. I had nightmares about struggles for spiritual survival, as though I was being torn in two, pulled by two different worlds, and my soul cried out for help. I woke up drenched in sweat and screamed, "I'm aliiiiiiiiiiiiive!" The sound of my scream was drowned out by the noise of a storm outside. The rain pounded on the roof and windowpanes, and the wind slammed the shutters of the large wooden hut I slept in. I sat up in my bed, breathing heavily, as though I had just been in a fight. It was pitch black, as our camp had no electricity. I realized that I was undergoing an internal struggle: Was their a G-d, or not? Was Judaism Truth? Was there a Creator, and a World to Come? Or was Buddhism Truth? The two contradicted one another, and each one invalidated the other. I stood between the two, at a spiritual crossroads, and I had to make a decision immediately. If I chose Buddhism, than I would be cutting myself off from my heritage forever. I got up and went out to use the bathroom, and when I got back to my room, I locked the door from the inside and fell into a deep sleep. I failed to notice that my Sri Lankan roommate had also stepped out when I did, and I had locked him outside in the pouring rain. He pounded on the door, but I didn't hear him over the noise of the storm. Finally, he banged hard enough to wake me up. I jumped out of bed, and in the pitch dark ran towards the door to open it for him. In my half-awake state, I forgot that there was a row of empty beds between me and the door. I ran right into the first bed, and hit it with such force that I flew into the air and tumbled over onto the floor. Hurt and in shock, I crawled the rest of the way to the door and opened it. I wanted to shout at my roommate that it was because of him I was injured. But I couldn't speak. I struggled back to my bed and lay down. I examined my body to make sure nothing was broken, and soon fell back into a deep slumber. In the morning, I woke up with excruciating pain in my little finger (the finger of Hashem…). It was purple and swollen, and I couldn't move it. I realized it was probably broken. I smiled to myself and said, "Now I know you exist, Hashem. You kept your part of the deal. You showed me, by touching me!" I understood that this whole world is just the scenery for a play, a backdrop for Hashem, who stands behind it all. I reviewed the details of my visions in my head, over and over again, and reached the conclusion that none of what I had seen was coincidental. It had all been part of a plan. My grandmother had tried to tell me to leave a bad place. I was shown the way to Truth, holiness, and light. I had been following a path of death, spiritual suicide. I had been shown that in my search for a release from suffering, I must follow the path of Judaism. If I wanted true redemption, the Geula of the Mashiach, I would have to follow the path of another leader. Buddhism was not the answer. No matter how I describe the process of "putting two and two together", and how I finally reached the final conclusion, I will never really be able to convey what an emotional upheaval it was for me, or how intense my spiritual transformation was. And it was all sealed when I broke my little finger. If anyone asks me how I became religions, my story will sound ridiculous. If I don't relate all the background information, and just offer the fact that Hashem broke my finger…people will think that all the rest was a figment of my imagination. But it all really did happen, and when I asked for Truth, Hashem made his Presence known by actually making contact with my body!!! I approached my teacher, and asked to speak with him. I told him that I was leaving the course, and returning to Judaism. He asked me, "What does Judaism have to offer, that you cannot find in Buddhism?" I answered, "There is a Mashiach!" He asked, "What is Mashiach?" I explained, "Mashiach? He is the one who will release us all. We will not need to each work individually to free ourselves, as he will free all of us. All of humanity, the entire Universe, all the galaxies together. All of Creation will be free of suffering. He is the one who will do that for us all!" And then the teacher aid, "This is ridiculous!" His reaction angered me, and I responded, "It is not ridiculous! It is what we believe!" I was surprised at myself, at how I had suddenly appointed myself as the spokesman and defender of the Jewish religion. But I suppose the belief in Mashiach had always been inside of me, and was now it coming to the surface. I noticed that as soon as my teacher realized he no longer had any affect on me, and that he would not be able to influence my opinions, his expression froze. His eyes, which had always been so full of light, suddenly turned dark and sober. His gaze was evil, and even malicious. When I saw the change come over him, I knew that there was no point in continuing our conversation. I had to get away from him, before he tried to harm me. I left the monastery, and Sri Lanka, and came back to Eretz Yisrael. My goal was to reconnect to kedusha [holiness], to Hashem, and to the Torah and mitzvot. My first priority was to find a teacher who could guide me on my new spiritual path - as I referred to it then. I now know that I was in need of a tzaddik, a righteous man of the generation. The man who had walked before me in my vision. Who was he? Where could I find him? My main goal was to locate that man. At first I followed the advice of rabbis who sent me to different yeshivas and kollels. But before long, I learned that none of them were right for me. I chose to listen to my inner voice, for it was that very same voice which had pulled me out of the dark and distant place I had strayed to. That voice had shown me the way to belief in Hashem, and I had to be loyal to that voice, and trust its advice. So I went to Tzfadt, and immersed for the first time in the Ari's mikveh. There, I met a Breslov chassid, a long time baal teshuva who had worked in the past as a stuntman in Hollywood. My new friend took me to the beis knesses of the Holy Ari, and studied the book Likutei Moharan with me. I felt an immediate connection to Rabbi Nachman, and I knew without a doubt that he was a holy, heavenly tzaddik. My soul cried out, "This is IT!" I was invited to the chassid's home for Shabbat - the first Shabbat I ever observed in my entire life. He introduced me to his community, and to the Breslov yeshiva in Tzfadt. But I couldn't spend too much time there, because something still did not feel right. However, I didn't understand what was missing right away, because Breslov seemed to provide me with everything I needed. Then my inner voice urged me to go to Meron. I traveled for the first time in my life to Meron, to the tomb of Rabbi Shimon Bar Yochai. There, I asked where I could purchase Breslov books. At that time, they were not widely available in stores. I was sent to a home in the Meron moshav, to a Breslov family that sold the books. When I entered the house, I saw pictures on the wall of the holy Saba Yisroel Dov Odesser. In addition to the fact that he looked very familiar to me, I suddenly understood why my inner voice had brought me to Meron. That was the man I had been searching for. He was the one who had walked before me in my third vision. 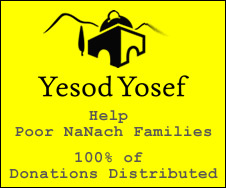 Ever since then, I have been a chassid of the Saba Yisrael, and I publicize his works and his teachings, and his holy name: Na, Nach, Nachma, Nachman MeUman. Of course, I have left out many details of my story, and skipped over a lot of stages, especially at the end. Because that is a story in itself, and this is not the place to elaborate. In any case, I hope that the message I want to convey has been absorbed, even though much of what I have to say has been omitted. I want to express my thanks to Hashem for allowing me, in His great mercy, to come out of the darkness and see the light. I have received the gift of Hashem's light, and the tzaddik's light. Thankyou Hashem, source of all blessing, merciful Lord, Amen. I would like to bless the entire Jewish nation, those who are far away, and those who are already close (especially those who are close - for sometimes "close" can be more distant than distant), to come even closer to the holy tzaddik, and through him - only through him - to come close to Hashem, blessed be His Name. And may the light of the holy tzaddik light our way in the world, may his holy name, Na, Nach, Nachma, Nachman MeUman be known throughout the world. And may this story of mine receive the significance of a private sippur Yitzias Mitzrayim, with all the obligations that come with such an experience. I must publicize the miracles that Hashem performed for me, and that He performs miracles for each and every one of us, in every generation. For it is praiseworthy to tell the story of Yitzias Mitzrayim. May we all merit to witness the Final Redemption, in the merit of the tzaddik, Rabbi Na, Nach, Nachma, Nachman MeUman, who walks before us. Amen.